I love dressing up for Halloween. Now that I have a dog I want him to love dressing up for Halloween too. put on extra clothes, either. We like to go to dog charity events to support the rescue organizations that have helped us rehabilitate Blitzkrieg and tell his story. Some of these events are Halloween events. Blitzkrieg quickly learned the cuter the costume, the more treats humans give you. Blitzkrieg learned to tolerate several types of sorta dog costumes in order to swindle as many treats as possible celebrate Halloween. Safety Tip: Never leave your dog unattended while wearing a costume, especially if it includes something around his or her neck like a bandanna or they make choke or worse. If your pet isn’t into dressing up don’t push it. Remember pets weren’t born to wear clothes anyway, that’s something we humans thrust upon them. Use Bandannas. 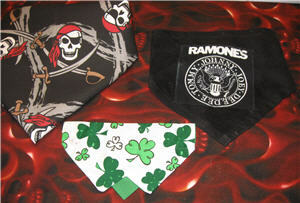 I’ve made bandannas that tie, that Velcro around the his neck, and bought a few that slip over Blitzkrieg's collar. 1.Pirate. Since we love history and pirates, I bought Blitzkrieg a human pirate banana and cut it down to Pekingese size. I had enough left over to make Blitzkrieg’s Scottie dog friend Max a pirate bandanna too. If you have a bigger dog, you can just use a human size bandanna just as it is. 2. Irish – I bought this bandanna for Blitzkrieg from a local crafter. It slips over his collar and is an option for dogs who take off regular bandannas. Use what you have. 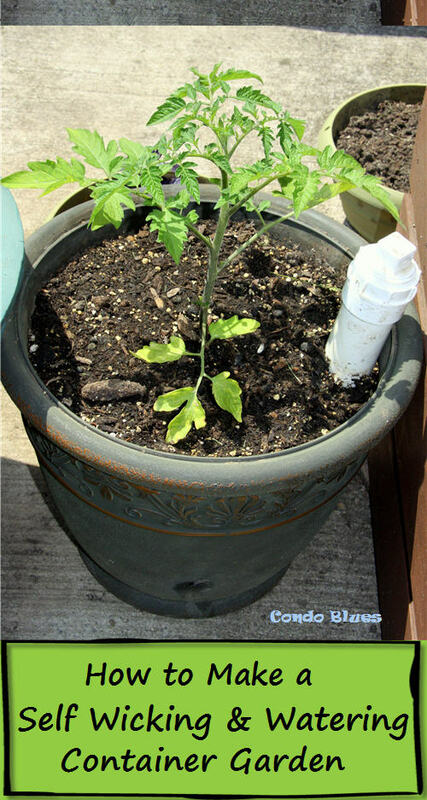 The greenest and cheapest thing is use or reuse something you already own! 4. 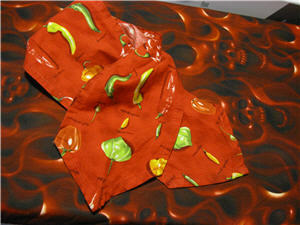 Chili Dog – This tie came with a fajita pan and is just the right size to tie this as a scarf around Blitzkrieg’s neck. 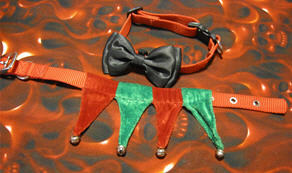 Use something that clips or slips onto the collar or use a fancy dress collar. 5. James Bond – This bow tie Velcro’s around his collar so Blitzkrieg can be James Bond. We are in heavy negotiations for me to build Blitzkrieg a rocket car to go with his super secret agent persona. I told him I’d do it but only if he can find a bio diesel powered jet engine. Trying to keep it green here, folks! Use something from dog sports. 7. Hiker/happy camper. One of Blitzkrieg’s favorite sports is backpacking. Most small dog backpacks are decorative or carry the weight in the wrong place for a dog. That is why I ponied up the bucks and bought Blitzkrieg a Ruff Wear dog backpack . It is Blitzkrieg’s favorite “costume” because people think it is cute to put extra treats directly in his doggie backpack. Blitzkrieg lets them because he is nice like that. Let's test how many treats my pack will hold. I know you wanna! 8. Lifeguard/boater I bought a dog life jacket and taught teach Blitzkrieg how to swim. It’s a little bulky but Blitzkrieg could wear his puppy life jacket as lifeguard costume. For the record I like my water muddy and smelling like dead fish or duck poo. Dress the dog’s crate or a wagon. 9. Balloon Boy I made my dog balloon boy costume with recycled materials and around Blitzkrieg’s wheeled dog carrier last Halloween. Blitzkrieg prefers to walk at events because he can floor surfing for dropped noms. However, we made up for that by buying his favor with carrots (one of his favorite treats) and his Balloon Boy costume was such a hit it meant he got his picture taken a lot, which he likes even more. Do you dress your pet up for Halloween? What will they be? Do you have an idea what Blitzkrieg should be for Halloween? Looking good Blitzy! Romeo wears t-Shirts and such so halloween isn't so hard to find him something. He really wants to be a doggy Intellectual and sit at a table at the coffee shop, reading a mag and and eating pastry! I bought a hot dog costume for our little dog last year. It's especially fitting for her because she was named 'hot dog' at the animal shelter before we adopted her. The year before that, the little one was a punk rock dock, which only involved spraying her natural mohawk with green temporary dye. How cute! I bought a tutu for my golden retriever. She loves it. She jumps up and looks like she wants to dance with it on. The Balloon Boy/Dog Kills Me!!!! We live in Denver and my husband is in the news business so no one around here is doing any balloon boy costumes I can tell you that. Denver is still a little sensitive about it, BUT for everyone else...hook your doggie to a mylar balloon...sssssooooo funny! We play up Arwen's skin condition and dress her up as a zombie. She's such a sweet, good natured doggie she's up for anything. That pup of yours has the best smile! Good boy, Blitzkrieg! 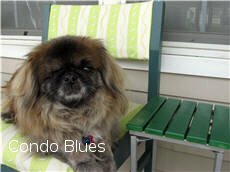 too cute...i have a perfect peke too Mine HATES water, i could not believe yours went in.. I've got three dogs and only one likes to dress up-at least I've got one! 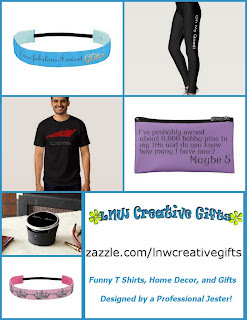 Hey I read Cathie's blog too, love her! Tried so hard to win one of her new books on onesies but no luck. Glad you won one of her books:) You have so many suggestions for dog costumes, very creative. Thanks for sharing with us at A Crafty Soiree! Please join us next time too! Darling ideas!!! TFS them on Thrilling Thursday @ Paisley Passions. What a totally cool name for a dog...Blitzkrieg. Does he have a nickname? He's really adorable, Lisa.